Cooked vegetable. 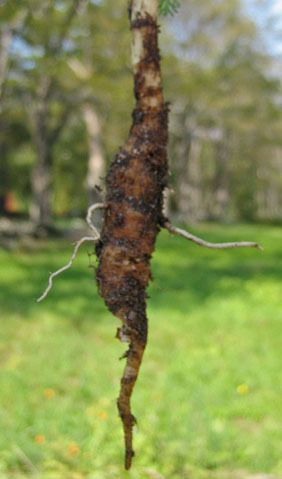 The first-year roots can be used like garden carrots. Leaves: Rosette of deeply lobed leaves, with long petioles, hairless on top, can be hairy on underside. Flowers: Small white blossoms in flat-topped clusters, said to resemble lace. Blooms in the second year, late June through August. Bracts: Stiff and forked, with 3 points. 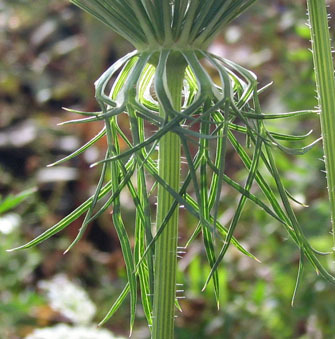 Stalk: Hairy (IMPORTANT: the hairy stalk is a useful characteristic to distinguish Queen Anne�s Lace from Poison Hemlock, which has a hairless stalk. 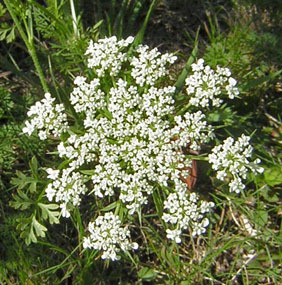 Poison Hemlock can cause paralysis and death even in small amounts). Root: White, with the characteristic carrot smell. Waste places, fields. It s found throughout the eastern United States. Any time from fall to late spring after first growing season. After this, root becomes woody. Queen Anne's Lace is also known as Wild Carrot, Bird�s Nest, and Devil�s Plague. 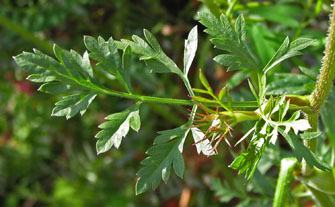 Any part of the plant will give off the characteristic carrot smell when crushed.